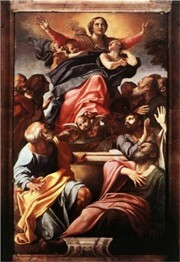 Carracci/ Caravaggio: Contrasting Styles of Painting in 17th Century Italy. Annibale Carracci and Caravaggio were the two most influential Italian painters at the beginning of the 17th century. Both were recognised in their time as artists who, reacting against the style of Mannerist painting prevalent in the second half of the 16th century, had brought back naturalism to painting. They did so, however, in completely different ways. By far the most Classicising of Annibale Carracci's followers was Domenichino (1581-1641). His fresco paintings in San Luigi dei Francesi, Rome, have a simplicity and austerity that is lacking in the more sensual and sentimental works of others like Guido Reni (1575-1642). This quieter style of painting was greatly admired by the highly intellectual French classicist painter, Nicolas Poussin (1594-1665). See also the work of Carlo Maratta (1625-1713), who became the leading Baroque artist in Rome after the death of Bernini. One of the most important categories of art developed by the "classical" painters of the 17th century was landscape painting. In Annibale Carracci's Flight into Egypt (1604) the figures have been totally overwhelmed by a landscape which, though containing much naturalistic detail, is a highly ordered and tidied-up vision of nature. This work was crucial for the development of the ideal landscape, a type of painting particularly associated with the French artists Poussin and Claude Lorrain (1600-82), and which became the most accepted form of landscape painting, lasting well into the 19th century. 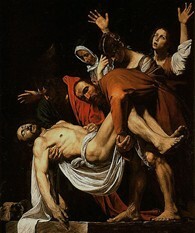 By comparison, Caravaggio (1571-1610), born near Bergamo in Italy, was in his lifetime an immensely controversial figure. A violent man, he was nevertheless an energetic, productive and extraordinarily influential painter whose signature style - known as Caravaggism - was emulated by artists across Europe. Inspired by his creative use of chiaroscuro and the more theatrical tenebrism, his numerous followers are known as Caravaggisti, and include such masters as Rembrandt (1606-1669) and Velazquez (1599-1660). He was particularly influential in Naples - see Caravaggio in Naples - and on the Neapolitan School of Painting, exemplified by Battistello Caracciolo (1578-1635), Jusepe Ribera (1591-1652), among others. For most of his working life Caravaggio was a fugitive from the law or other authority he had offended and, in the last year of his short life, he was left for dead in a back alley in Naples where one of his enemies had caught up with him. He rarely stayed more than a few months in one place - fortunately he was a quick and fluent painter. Despite this fiery life, his work from the first was original and revolutionary. Rejecting the pretty idealism of both Carracci's re-packaged Renaissance art, as well as Mannerism, Caravaggio used ordinary working people as models for Christ, the Virgin and the Saints. For instance, in The Calling of St Matthew (about 1600) he shows Christ appearing to the saint in a tavern, while in The Death of the Virgin (1606), Mary is modelled on a streetwalker. For other naturalist scenes, see also Supper at Emmaus (1601), The Crucifixion of St Peter (1601) and The Martyrdom of St Matthew (1600). Caravaggio's "street naturalism" fitted perfectly with Rome's call for greater realism in Catholic Counter-Reformation Art, although conservative figures thought Caravaggio's particular brand of realism went too far. Works by Annibale Carracci, Caravaggio, and other 17th century classical realist artists can be seen in some of the best art museums in the world. For a modern view of classicism, see Classical Revival in modern art and also Neoclassical Figure Paintings by Picasso (1906-30).  For a chronological guide to the evolution of painting, see: History of Art Timeline.  For information about painting and sculpture, see: Homepage.